EL Wire is a very robust material – it can withstand fairly extreme temperatures between -20°C and 50°C. It is durable and the wire itself is water resistant. If the wire is likely to get wet or even be in a humid environment then make sure the end of the wire has been made fully waterproof, also the connection point is sensitive to moisture. Even if the material itself is hardy, like any electronics it has to be looked after if you want it to last a long time. This goes double if the EL Wire is going to be worn, where it will be exposed to various stresses that electrical items are sensitive to. 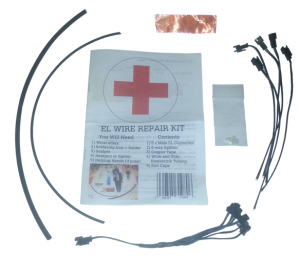 EL Wire will be reduced if it is exposed to repeated bending stress, extreme pulling tension or humid conditions. Also, unlike most electrical appliances, the two wires never meet to make a circuit. 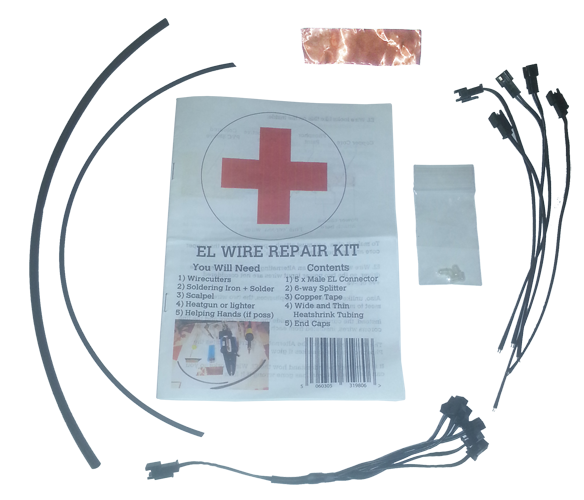 It is important to understand how the EL Wire works to help you find out what has gone wrong if it fails. 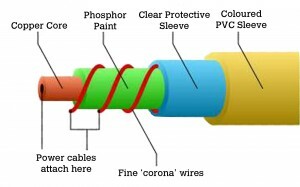 The most important thing to note is that if the copper core and the fine corona wires ever meet and make a circuit, then the EL Wire will not glow. Quite often, this will not only stop this EL Wire from glowing but by creating this circuit you will probably stop all the other EL Wires that share the same splitter from glowing. When all the EL Wires on a circuit are off, this can then make the EL Driver overheat if it is still switched on! 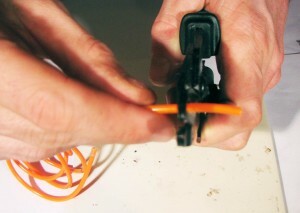 Removing the faulty EL Wire from the splitter will then make the other EL Wires spring back into life. 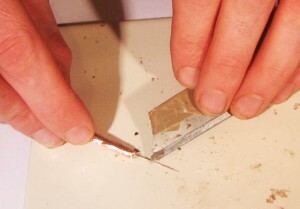 Repeated bending stress may cause some of the Phosphor Paint to flake off leaving the core exposed. 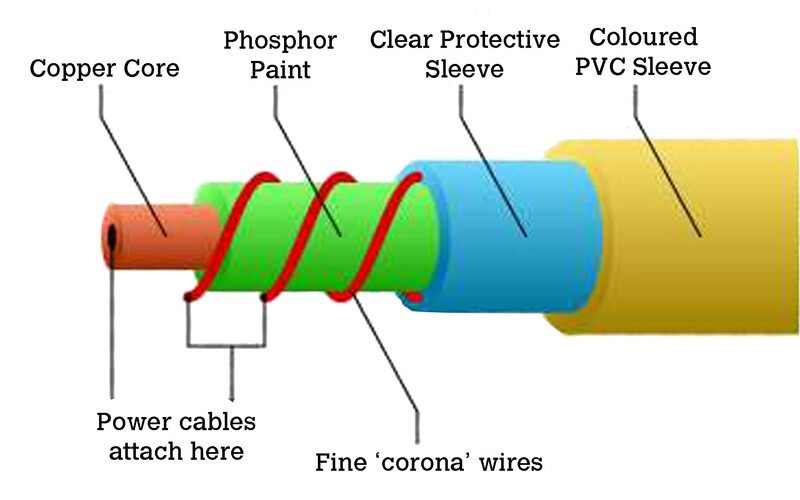 The corona wires are then able to come into contact with the core and make a circuit. Another cause for failure is when the core and corona touch at the very end of the EL Wire, if the wire hasn’t been cleanly cut. Any moisture or dirt on the very end if the EL Wire will conduct current across from the core to the corona wires. So the first step to repairing the EL Wire is to check the end and maybe even cleanly snip 1cm of EL Wire off the end to make sure this is not the fault. To help you strip back the next protective coating and leave the corona wires intact, I recommend lightly heating this inside sleeve. Then use the wirestrippers to remove this softened plastic sleeve. Heating should prevent the corona wires underneath from being totally yanked off with the sleeve, or even damaged by the wirecutters. These corona wires may be fine, but they must also be strong enough for whatever you are going to put them through. It is better if these fine wires fail on you now and you start again, than they fail when in use. 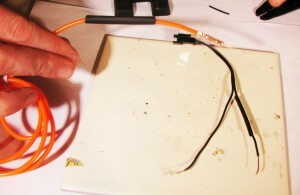 Stick a 1cm wide section of copper tape around the top of the EL Wire and allow the corona wires to be trapped inside between two layers . Now you must scrape about 1.5cm of the Phosphor Paint off to reveal the copper core underneath. 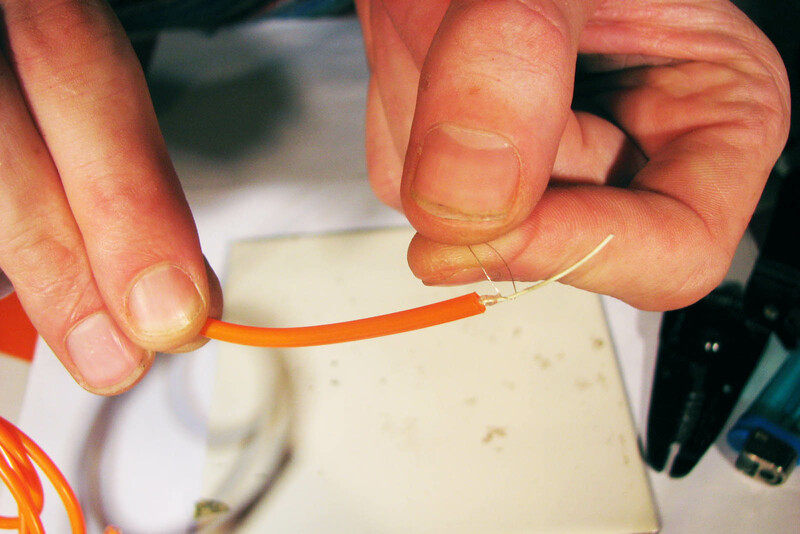 Next, to prepare the Power Cable you must strip 1cm off one of the strands, then cut the other one back so it is shorter than where the other has been stripped down to. Then you must strip that cable back 1cm also. You must cut some heatshrink tubing and put about 3cm of the ‘wide’ tubing on the EL Wire and about 2cm of ’thin’ tubing on the shorter Power Cable strand. 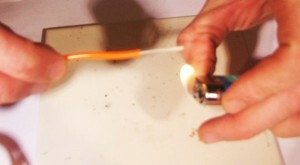 Slide the thin heatshrink over the core and heat it up to shrink it. 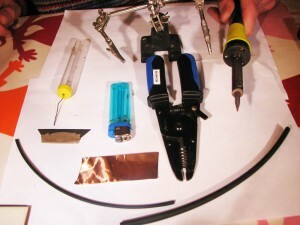 Leave it a sec to cool down,then slide the widerheatshrink over all of the copper tape and core. Heat it to finish off the repair. 2) Switch Driver Off After Use – if you unplug the wires from the driver it will still carry on draining the batteries. Plus, this damages the inverter inside if it is on with no EL Wire attached. 3) Adding More Wire – you can ‘daisy chain’ many splitters together and have many wires coming off a single inverter. 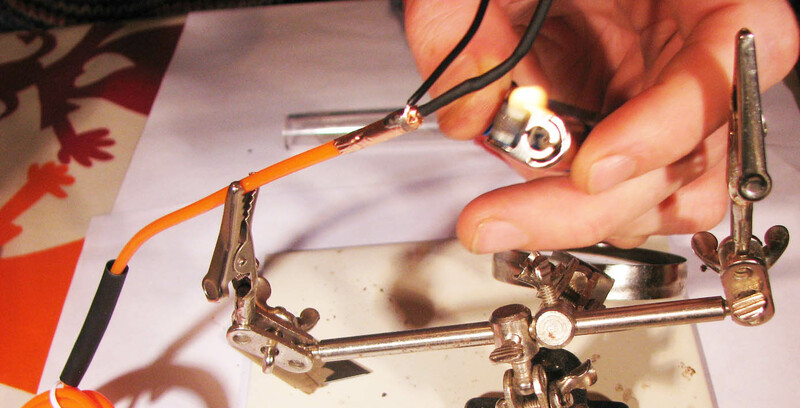 4) Any Glue Is Fine – for fixing wire to a costume. E6000 or Hot Glue is the best. Remember if it is being permanently fixed to clothing it will be hard to replace if it fails as some point. 5) Protect The Connection Point – The inch of tubing where the power wire joins to the glowing EL Wire is BY FAR the most fragile and vulnerable area of the EL Wire. Lightpainters are advised to tape up and reinforce this part (as well as the wires that come out of the EL Driver) before they start swinging it around. If you’re using it on a costume, be sure to keep this part away from elbows or anywhere it will suffer stress. Thanks for this review and for your site on the whole. I’ve just shared it. can the tapes and panels be cut to shapes? I have quite long offcuts of EL wire that are going to waste as I can’t solder the connectors on myself. I have tried and failed! I purchased the wire from a US site and it’s only 0.9mm thick. I was wondering if it would be possible, if I paid you for parts and labour, to send them to you and have you attach some connectors for me?